People often ask me, “Why did you choose Cardiff?” The first few weeks of class I kept my little secret to myself. I was fearful people would discount me for my answer, because let’s be honest, who bases their whole life around a dream? Recently I’ve began to tell the truth despite the fact there’s absolutely no rationality to it. Perhaps I’m risking my whole life on the chance to be something I’m not, but I can’t imagine life without at least trying to find my own happiness. It began with my most favourite childhood possession, a stuffed teddy-bear given to me by my grandmother when I was little. This bear, who my grandmother named, was my best-friend and my comfort for most of my young life. I could tell Teddy all my secrets and he always understood, he never judged me. As many only-children know, the expectations of your parents often conflict with the nature of being a child. Adulthood couldn’t seem to come fast enough for my parents who always expected a perfection that I was often unable of obtaining. It usually revolved around me following my heart in what I thought was best, only to find out I failed miserably. I remember the day I tried to help my mother in the garden by planting seeds, and which upon explaining my deed covered in dirt, was told “You just flushed them down the toilet.” Of course she was right, but to this day I’ve never been able to explain to her that my intention wasn’t to ruin her entire garden. No, I remember that day vividly, repeating “I’m sorry” over and over again with tears rolling down to my face. Teddy and me eventually found our way to my bedroom, door closed, praying to some magic man in the clouds to fix things, asking for help, because he must know my true intentions. No one ever answered, and soon Teddy and me dreamed of far away lands across the ocean that when we grew up, we’d escape to. Places where they’d understand us, a place where maybe someday I could become something my parents would be proud of me for. We rehearsed with fancy tea-parties on the front steps of the house to be sure we were well prepared for when that day arrived. Eventually childhood dreams fade and adulthood sets in. You wake up one day working in a cubicle for a pittance thinking this is the best you’ll ever be. Every doubt realised, every failure a reality of the world, that dreams aren’t really meant to come true for normal people. Indeed the world came crashing down with the loss of my grandparents. At the funeral my phone rang, to which I answered and was told I had been terminated of employment. Officially, they where rescinding my medical leave (I had a surgery upcoming), leaving me absent from work, but the real reason was obvious from the many previous conversations with Human Resources. I was being fired for being in a relationship with another woman. In the end, I went home, crawled in bed with Teddy and cried for days. I had failed in every possible way you could in life. I was unemployed, uneducated, and a nervous wreck holding a fifteen year old stuffed toy sobbing like a child. Oh how I would have given anything to escape from my existence in that moment. To run off to some far off land where no one knew me and start again. But then, no, then I didn’t even see that as a possibility, my world view was too narrow to consider anything beyond the expectations set for me by others. Yet there was something there that wasn’t there before. Something inside me that didn’t exist prior to falling down. It was tiny, like a prick to the finger. An accidental firing of a single neuron in my brain that diverted my entire future. A spark. The funerals of my grandparents suddenly made me reflect on my own mortality. Suddenly I wanted to know who I was. In the weeks that followed I researched my ancestry. Spent day and night tracing lineage back in time till finally I reached one single word, one location I had never heard of before. That night I fell asleep and into a dream. There, on an ocean-side carousel, I stood gripping on for life, spinning around, a wet mist upon my face, my hair trailing behind me. That me seemed, somehow, happier. The ride came to a stop. My grandmother is standing there repeating the phrase, “It’s coming for you, what will you do?”. I woke up the next morning and typed that single word, that city that I had never heard before, into Google and clicked on Image Search. 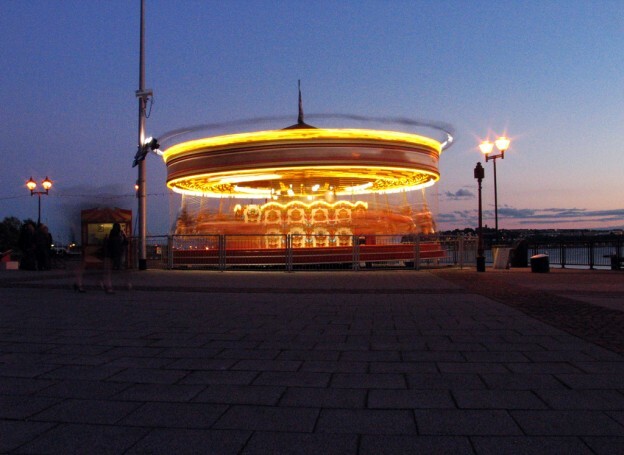 The first picture that came up of Cardiff was the (now defunct) Carousel, set on the pavement at Cardiff Bay. When I said it was a dream, you probably thought I meant metaphorical, right? So I cashed out my savings and bought a ticket to Wales. While walking through the market there, there was a single stall with a woman selling teddy bears wearing t-shirts. I stopped for a moment, confused as to why they had my bear’s name on their bear’s shirt. The merchant, perplexed by my dumbfoundedness approached me and asked if everything was okay. I replied, “my bear’s name is Cwtchy” too. She laughed then explained the word to me. It was only a matter of time after that before I decided that Cardiff is where I wanted to spend the rest of my life. It’s taken me four years, going back to school, earning two degrees (and working on a third), learning another language, and risking everything to be here, but here I am. I’ve never been closer to my dreams than I am at this very moment. Why did I choose Cardiff? Because I chose to live the dream, and make this permanent. Who am I? Right now, I’m everything I ever wanted to be.